It's the road of the year. It's the A2018. It's also a road packed with interest, and one end of it's in London. So let's go for an end-of-year walk. 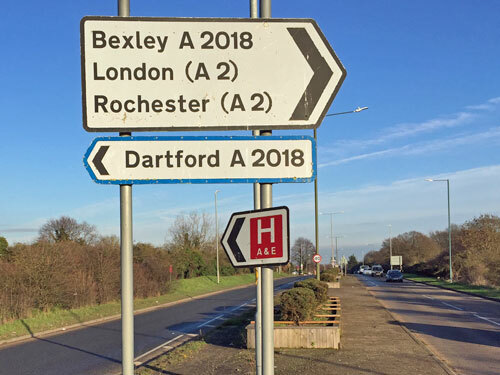 The A2018 is three miles long and links Bexley to Dartford. In the 19th century it was two country lanes joined by a track across open heathland. In 1927 a short section was dualled to take the A2 trunk road to its new course on Rochester Way, and in 1970 that was further bypassed as the A2 went full-on arterial. 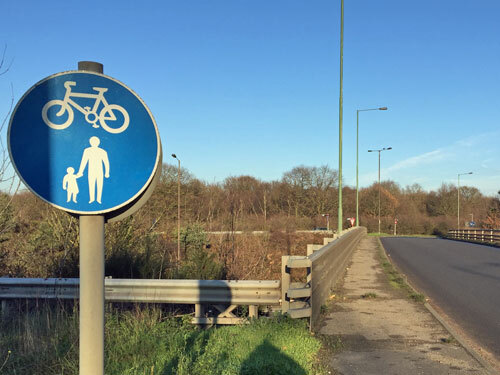 What we have now is a suburban lane leading to a massive grade-separated interchange amid an Area of Outstanding Natural Beauty leading to an oversized dual carriageway leading to a twisty residential artery. It was all a lot more interesting than I was expecting. 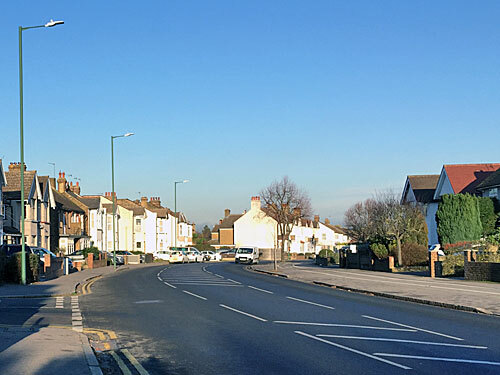 The western end of the A2018 is called Vicarage Road, and begins in Old Bexley, just beyond St Mary's church. 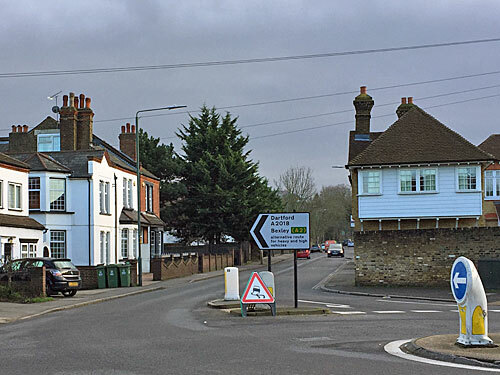 It breaks off from North Cray Road at a mini roundabout by the former Coach and Horses pub, which has planning permission to become flats, because that kind of thing happens even out here on the edge of London. 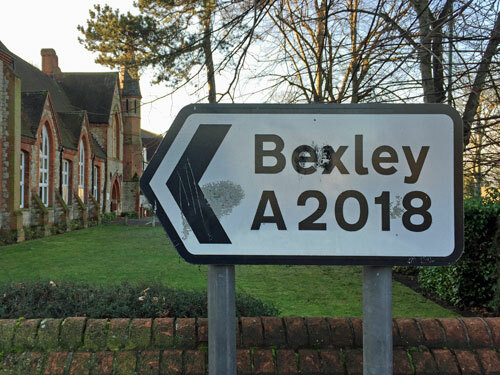 The first stretch of road boasts some fine Victorian villas, and a cul-de-sac which used to be the vicarage, and the whiff of manure from the Old Bexley Equestrian Centre. 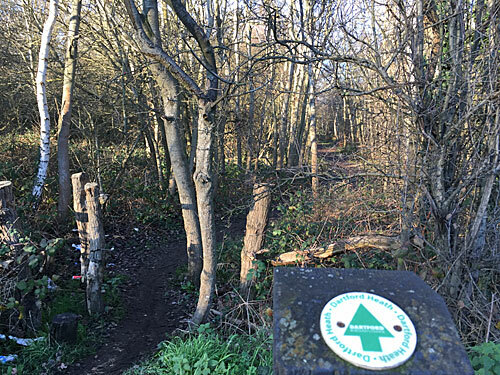 If you've ever walked the London Loop this is the very end of section 1, around the point where you start wondering if it's all going to be worth it. Vicarage Road climbs in cutting, because the land around it is rising more steeply. A horse watched me from an unfeasibly high vantage point across some paddocks. A moped rider in a blue Cookie Monster onesie sped by, and it was hard to gauge whether that was a Christmas present or just normal for round here. A row of houses on the bluff cover what was once an orchard. The house on the corner of Hill Crescent has a green copper roof and palm trees in the garden, and wouldn't look out of place in Metro-Land. This is the bijou suburb of Coldblow, an exposed elevated enclave with some of the most expensive houses in the borough of Bexley, and whose residents once included Roger Moore and Dorothy Squires. 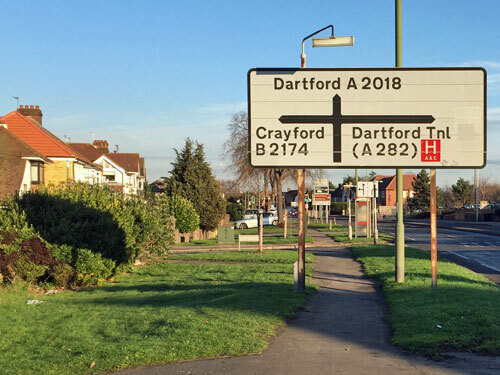 Now called Dartford Road, the A2018 curves gently past an increasing number of lesser bungalows and a lonely Baptist church. Every road which feeds in is part of London's Low Emission Zone, despite all of them being ultimately dead ends, but the A2018 remains drivable even by the filthiest exhaust. On the inside of the bend is the Cypry Angel Pool Fishery, a carp lake excavated only last year, whose 12 swims include "bars,plateuxs islands reeds and Lilly's". I can confirm that it's a busy destination for the Bexley angling set between Christmas and New Year, and that at least one of them arrived, rod in hand, by B12 bus. The last shopping parade in London is a six-unit affair, which currently features a dry cleaners, an off-licence, an e-tobacconists, a hairdressing salon and a Chinese takeaway. 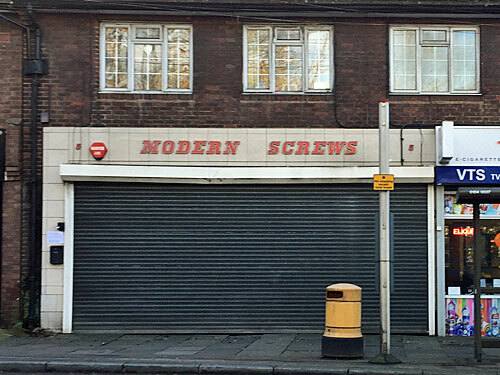 The sixth shop is the fantastically-titled Modern Screws, its name displayed above the shutters in a typeface that's anything but modern, and which'll be reopening for the sale of pop rivets, grub screws and self tappers next Monday. To the left of Lou's Kitchen is a white coal tax post, one of 200-or-so surviving markers from the days when levies were charged on coal entering the Metropolitan Police District. Here the road changes its name to Old Bexley Lane, and a more obvious road sign welcomes drivers to Kent, The Garden of England. The county boundary comes at the edge of Dartford Heath, the first vestiges of which are hidden behind a fence as the road ascends. 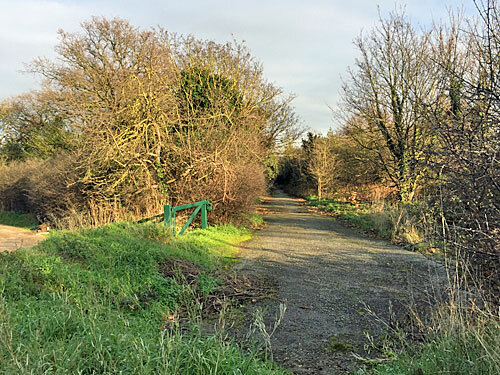 In the 19th century the land alongside this stretch of country lane belonged to a large house called Baldwyns Manor, whose estate was sold off to the LCC in the 1870s for the construction of an enormous mental asylum. Its workers needed somewhere to live, so a trio of lowly terraced streets were built across the lane and the resulting hamlet was named Maypole. Now festooned with satellite dishes and with BMWs parked out front, it's a fair bet that none of the current residents are NHS orderlies. 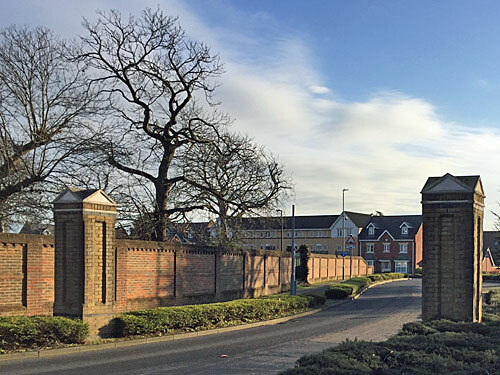 The asylum survived until 1998 after which it was knocked down to create Bexley Park, an exclusive housing estate, with the chapel transformed into a health club and the main house repurposed as luxury accommodation. 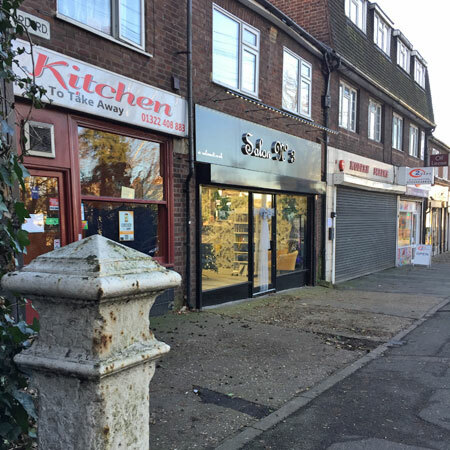 The only two shops on site are a Londis and a foodie-friendly delicatessen called Dennis of Bexley, proud winners of a Diamond Award for their Turkey Cracker encroutes, and emblazoned outside with adoring quotes from the like of Rick Stein and Heston Blumenthal. Old Bexley Lane originally veered off across the heath from a point opposite the main gates, but that link was severed when the A2 intruded, and a decaying strip of tarmac now runs off into an evergreen wilderness for a few hundred stunted metres. 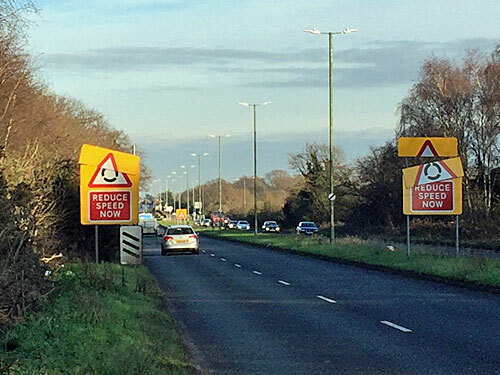 The next section of the A2018 is not meant for pedestrians, even though signs suggest they're catered for. 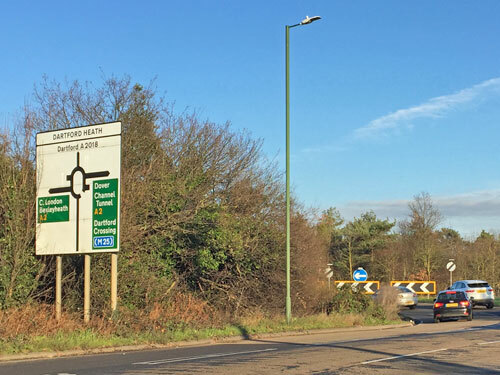 Immediately ahead is the Dartford Heath roundabout, which gouged out the heart of the heath fifty years ago, before environmental campaigners grew teeth. A ring of traffic sits atop a dual carriageway in cutting, and those on foot must take their lives in their hands when crossing the entry and exit slips. 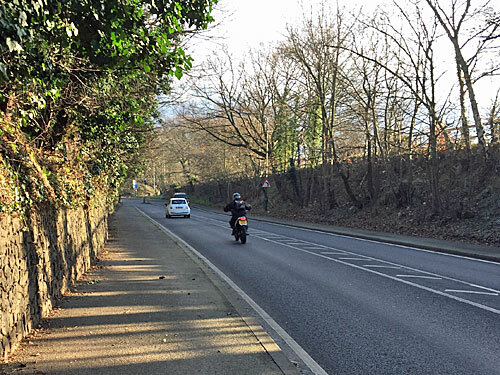 The pavement exists almost as far as the northern side, then suddenly disappears, leaving those on foot to proceed with caution along a bumpy verge. At one point a badly positioned countdown marker forces pedestrians into the traffic, and basically don't try this journey yourself. Every so often a genuine footpath disappears off into the trees, presumably the continuation of another path arriving on the other side of the dual carriageway, and a sign announces the Fire Post number to be quoted in case of conflagration. Eventually another roundabout appears, smaller this time, but still adrift in the centre of an unpopulated heath. This is the junction with Rochester Way, which used to ferry the A2 Channel-ward between 1927 and 1970, but now only runs for half a mile before petering out and merging into the suburban road network. For the road-numbering fans amongst you, everything I've walked so far was originally designated the A210 in 1922, downgraded to the B2210 in 1935 and reupgraded to the A2018 in 1970. From here on the road is called Shepherds Lane, which is a nod to the utter backwater it started out as. The arrival of the A2 instead transformed this particular half mile into a dual carriageway, now with a line of gorse-filled planters up the central reservation. Students of geography will recognise classic ribbon development, a chain of large semis facing a busy road, and not ideal for the families with five cars in their front garden trying to get in or out. These are the outskirts of Dartford, where suburban avenues mesh up against what used to be the Dartford bypass before the new A2 did a much better job. After the last mega-crossroads things calm down somewhat. 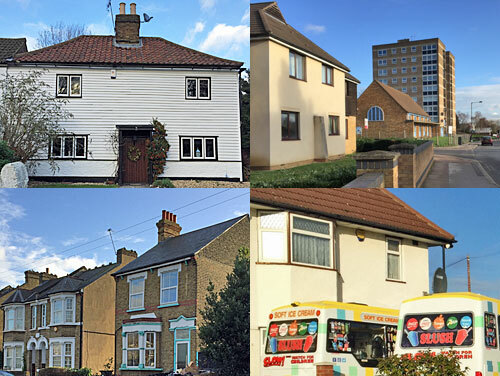 This is the section of the A2018 that's been the A2018 for longest - over ninety years - and is lined by houses of a similar age. One has a 'No Riff Raff' sign in the porch, and a plague of overblown Christmas decorations across its garden which suggests the opposite. Numbers 32a, 32b, 32c and 32d have been carefully squeezed into a formerly vacant plot. The Shepherds takeaway has a poster outside declaring that its 18 inch pizzas are the biggest in town, whereas I'd have thought all 18 inch pizzas were the same size. It's taken a while, but the road here feels almost normal. 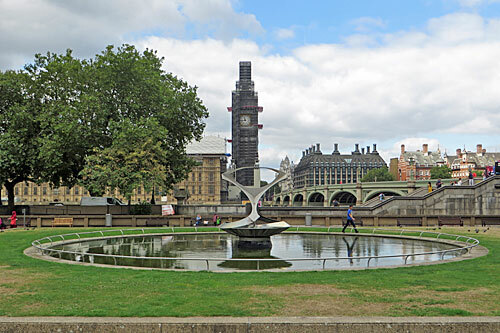 2) Palace of Westminster: With the right invite, an after-hours tour can take you behind the Speaker's chair, round the government's back passageways and onto the river terrace for a beer. Thanks. 4) National Physical Laboratory: I have seen the National Standard Kilogram, and a childhood dream is complete. 5) My local cashpoint: It wasn't the plan to start my birthday by having my card stolen, and then reused several times round the corner (but all was paid back happily in the end). 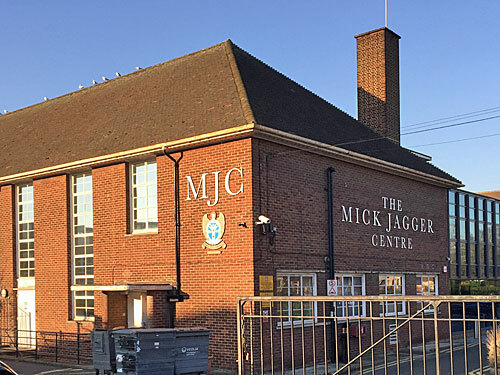 Jan) Coventry/Nuneaton: I started the year by visiting the birthplace of 2-Tone Records and the last resting place of Larry Grayson. Feb) Bristol: Using Bristol as a base, I explored Weston's pier, Avonmouth's docks, the new Severn Crossing and the very lightly used Pilning station. Feb) Warwickshire: On this day trip I crammed in Kenilworth Castle, genteel Leamington Spa and historic Warwick. Mar) West Yorkshire: I picked a snowy day to visit the National Coal Mining Museum, Castleford Bridge and the Hepworth in Wakefield. 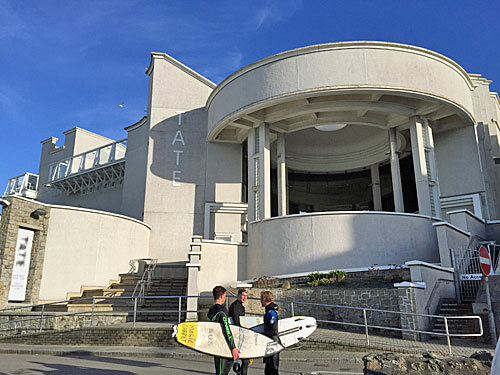 Mar) CORNWALL: I finally took it upon myself to go on a proper holiday, to the farthest tip of the country, which enabled me to harangue you with endless holiday snaps from Penzance, St Ives, St Michael's Mount, Mousehole, Porthcurno and Lands End. It was fabulous, despite the unexpected snow (and if you're very unlucky I may go somewhere else for longer next year and write even more). Apr) Chester: As well as discovering that Chester FC play in Wales, I walked the historic city walls and toured the National Waterways Museum in Ellesmere Port. Apr) Wigan/Bolton/Bury: In a single day I crammed in Wigan Pier, Hall i' th' Wood, Fred Dibnah's workshop and the East Lancashire Railway. Proper value. May) Birmingham: After a spin round The Coffin Works I tracked JRR Tolkien through the suburbs and followed the smell of chocolate to Bournville. May) Leicester: I came for Richard III, but found time to explore the rest of the city centre (and diverted to Melton Mowbray for a pork pie). Sep) East Sussex: Specifically Bishopstone, Seaford Head and Newhaven Marine, or thereabouts. Sep) Hereford & Worcester: Both cathedral towns, both cathedrals, two museums, two rivers and a medieval map. Nov) West Sussex: A glorious walk round Chichester Harbour on the Manhood Peninsula, destination West Wittering. As the year draws to a close, let's look back at what the weather's been like. Not because it's something we all want to reminisce over, but because it's interesting to see what a full year's weather looks like. The tables below show the weather for each day in 2018, grouped into categories and totted up by month. Yes, there are still three days to go, so I've used the forecast to predict the rest, and I'll come back later to update speculation with fact. You'll see I've blanked out the background of every empty cell, to make the pattern of the coloured data stand out more. I've also emboldened any tally that enters double figures, making the general trend a bit easier to follow. This is data from a weather station in Hampstead, so won't perfectly reflect your experience, nor the national picture. But it does present an intriguing picture of the year gone by, and 2018's weather really wasn't that bad. Hurrah, we had a proper summer this year. 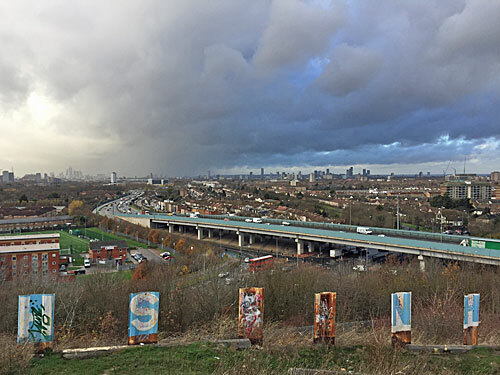 There were twelve days when the maximum temperature in London topped thirty degrees, which is twice as many days as either 2016 or 2017 managed, and a greater number than 2011-2015 combined. On top of that there were 35 days when the temperature topped twenty-five, which is a lot more short-sleeve weather than we normally get. The sultriest period was from mid-June to mid-August, with maximum temperatures running five degrees above the long-term average. February and March were the only colder-than-average months, courtesy of the fabled Beast From The East, which also delivered three days which failed to creep above freezing. It'd been five years since Hampstead last had one of those. Minimum temperatures show a similar rise and fall through the course of a year. Forty-three days this summer had nights with temperatures exceeding 15°C, ideal for sitting outside, and the temperature pretty much never went below 10°C. The end of the year enjoyed more than its fair share of mild nights, relatively speaking. Meanwhile there were as many as twenty-three nights, mostly in February, when the temperature dropped below freezing - again anywhere outside central London will have had rather more. We're not used to seeing actual sunshine data, more usually simplifying the weather to "gosh it's sunny" or "oh it's dull". This year we've enjoyed thirty-six days with over twelve hours of sunshine, all of them in the middle of the year because the sun's not above the horizon long enough at other times. The three months from May to July were abnormally sunny, which was just as well after a seriously overcast April. Overall seventy days had no sunshine at all, although astonishingly there were only six such days between the start of May and the end of September. Sunshine totals in September and October were well above average, while December has proved to be particularly dreary. It doesn't rain that often in London, with 60% of days this year (the bottom row) completely dry. Even most of the wet days weren't that wet - only forty days exceeded 5mm, and fifty days were sprinkled with less than 1mm. Normally a few days are relentlessly wet, with over 20mm of rain, but Hampstead had none of those this year. Instead southeast England enjoyed a rare midsummer drought, with June's rainfall total barely a splash in the bottom of the gauge, and the grass not recovering its colour until the end of July. The other much-drier-than-average months were September and October, while March took the crown as the wettest month. But rainfall is a notoriously erratic statistic, often varying wildly geographically, and one torrential outburst can outrank weeks of lighter precipitation. Finally, still based on observations in Hampstead, a look at some of the more unusual meteorological conditions. Fog has been absent this year, as has hail. As for thunder, late May was particularly rumbly and even November somehow delivered. Air frost was particularly prevalent in February, courtesy of the aforementioned Siberian blast, which is also why the heaviest snow flurries were in March. But aside from that frozen interlude and the summer's drought, the weather has been fairly ordinary. Here's to more typically atypical weather in 2019. I get around London a lot, as you've probably noticed. So every year I like to keep track of which bits of the TfL network I've travelled on, to gauge how my annual coverage of the capital is going. And this year it's gone really well. I've ridden the whole of the DLR, and tapped in or out at every single DLR station for good measure. I've also managed to traverse the whole of the Overground, even the runty Emerson Park line. The entirety of the tram network was a piece of cake in comparison. But I haven't done 100% of TfL Rail. I've ridden east all the way out to Shenfield, and as far west as Hayes and Harlington, but I refuse to stump up an extra tenner to do the Heathrow tunnel. Terminal 4 to Terminals 2&3 to Terminal 5 yes, because that's free, but not the London-bound connection. Despite my best intentions I completed the Dangleway this year because my brother had never been on it before. 2018 is also the year I rode on all the bus routes, simply for the hell of it, all 543 of them. Having followed that up with a ride on all 53 nightbuses too, I declare the bus network truly vanquished. So this year that's all the buses, plus every service shown on the tube map except for one little bit of TfL Rail. And I mention this because I've often wondered whether I was a completist, and it turns out I'm not quite. My miserly instinct came up trumps and convinced me not to bother with the very last extremity, and I can live with that. I'm not entirely obsessed, just tight. Since June 2017 TfL have been quietly chipping away at London's bus network by reducing the frequency of the buses in the hope that nobody will notice. This table summarises which bus routes have had their daytime frequencies cut this year, month by month, and how many buses per hour they've lost. There's a full list here. That's a total of 54 bus routes cut this year, by a total of 72 buses per hour. Last year it was 48 bus routes cut, by a total of 60 buses an hour. In addition 41 weekend nightbus routes have been cut since June 2017, by a total of 92 buses per hour. Next year's cull starts with a cut on route 102 on 5th January. And so it continues. Sat 1: My photograph of four inflatable pandas jostling the ticket barriers at Kings Cross is already in my Top 40 most-viewed Flickr photos (and is on its way to the Top 25). Sun 2: From the blurry top deck of the N65 nightbus, the streets of Ealing look dark and quiet and somewhat damp, and could basically be anywhere. Mon 3: Beckton Alp is somehow still accessible, and even the sign by the hole in the fence which said it was private property has disappeared. It's also a great vantage point from which to view an approaching storm (so long as you're down off the summit before it arrives). Tue 4: Barnet FC's former Underhill stadium has finally disappeared, and the skeleton of a new academy is rising in its place. Its football pitches will be rather smaller. Wed 5: A man does not need all the plastic bags he has accumulated, although throwing them away does nothing for the environment - all the damage was done in their acquisition. Thu 6: Forest Gate station is now fully open, its temporary staircases no longer required, in readiness for Crossrail opening at the weekend... oh hang on. Fri 7: Wait a week and you can get a Mars Advent calendar for a quid, at which price it is almost worth the money (given that it contains the same weight of chocolate as two Mars Bars). Sat 8: The latest exhibition at the Wellcome Collection - Living With Buildings - is rather good, especially if you like poverty maps, New Town plans, Modernist architecture and hospital demolition videos (runs until 3rd March). 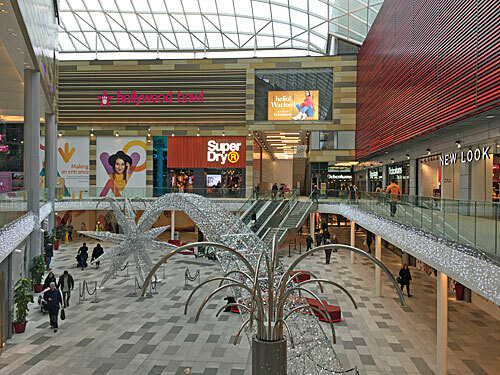 Mon 10: The new extension to intu Watford, where Charter Place used to be, isn't as large as I expected it to be. A lot of it is empty roofed piazza, the cinema isn't quite open yet, and what a shocking waste to have turned the former market into a Debenhams. Tue 11: We have improved your signing-in experience, say my online bank, who have instead made it harder. Wed 12: Stage 4 has not been triggered, so Stage 5 will not occur until the 2020s. Hurrah, I can now take all the post-its down off the wall. Thu 13: I worry that I shouldn't be eating baked beans now, I should be saving up all my cans for the bleak empty-shelved lowlands of post-Brexit springtime. Fri 14: I remember watching this episode of Top of the Pops in November 1986 and being utterly thrilled that Erasure had made it onto the show for the first time. If only I hadn't mistimed a university reunion I might have been in the Student Union to see them play just before they became famous. Sat 15: Heaven knows what effect this second miserably wet Saturday in December will have had on High Street spending. 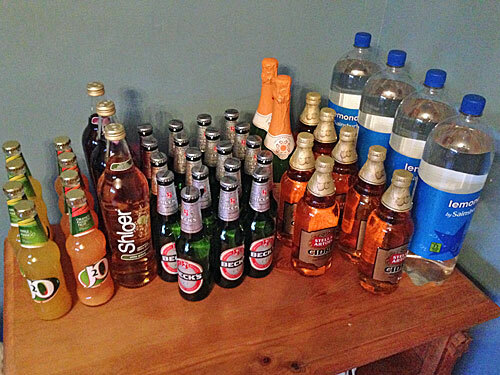 Sun 16: Many years ago I pulled a cracker and a bottle opener fell out, so rather than leave it on the table at the end of the meal along with the party hats and plastic 3D puzzles I pocketed it and took it home, so when BestMate rang and said "I've got cider but no bottle opener can you bring one over?" everything ended happily ever after. 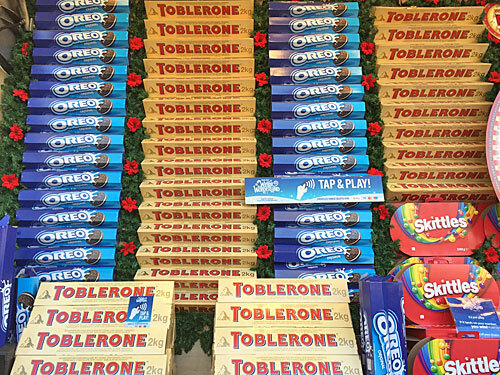 Mon 17: Winter Wonderland is already squidgy underfoot, with muddy brown water washing over the plastic flooring as you trek from sausage seller to ticket booth to Toblerone hoopla. Tue 18: It'd be a lot easier to hand-deliver this Christmas card if 86 was anywhere near 85 or 87, or even helpfully close to 84. 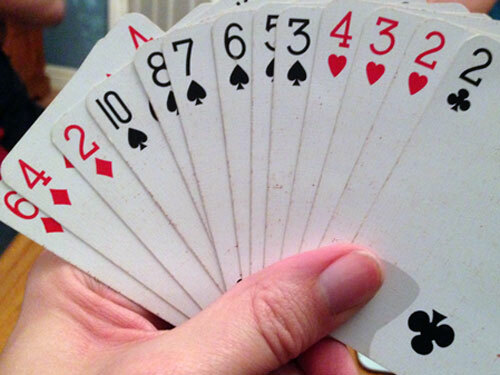 Wed 19: Trying to buy a birthday card in Chingford is really difficult at this time of year, especially when the person you're buying it for doesn't fall into any of the Mum/Brother/Gran/18/40 categories most of the remaining rackspace is given over to. 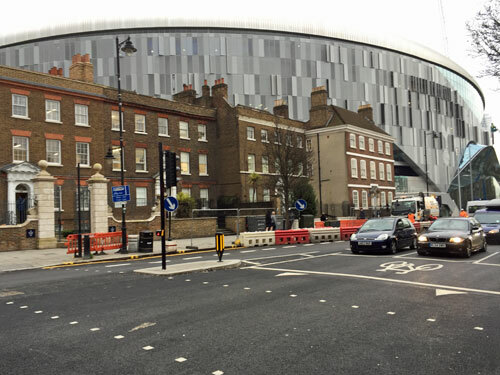 Thu 20: The new Tottenham Stadium squats like an alien interloper above the horizon of N17, facing off across the High Street towards the library and blazing it with blue screens. Numerous yellowjackets are working on it outside, and considerably more can be seen working on it inside behind stacked layers of shiny glass. 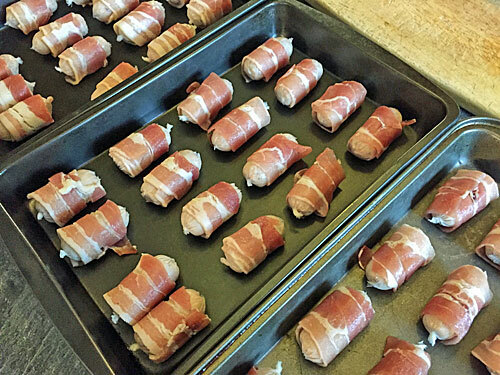 Fri 21: The special 'pigs in blankets' starters in this year's Pizza Express festive meal deal are so good that I'm already sad they'll never put them on the menu again. Sat 22: Thanks to the full moon, the walk from my Dad's house to the village pub can be attempted without the need for a torch. The adjacent table is taken by a group of former students from the local high school, back from their first term at university, comparing notes on debt levels, tattoos and how they're going to move away at the first possible opportunity. Sun 23: It's wet and it's muddy, but a few flowers brighten the spot. Mon 24: Our full Christmas food complement had been at risk because twirly crisps could not be sourced, but thankfully packets of salt and vinegar turned up in the third supermarket. 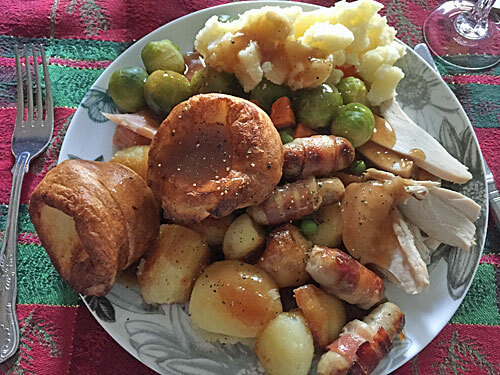 Tue 25: I don't know what your family's Christmas routine is, but our is [PRESENTS][COOKING][LUNCH][QUEEN][GAMES][TEA/TV][GAMES]. Wed 26: Thanks to the January Sales, the big TV we watched the Queen on yesterday is not the bigger TV we watched Only Connect on today. Thu 27: We were considering going to see the seals, but instead we stayed in, did a jigsaw and played on the Xbox (and then I got the train home). London's festively-named streets include Holly Hill, Angel Passage, Yuletide Close and half a dozen Noel Roads. But I've been out to visit a meatier choice, a historic lane to the north of Enfield, to see what traces of Christmas I could find. 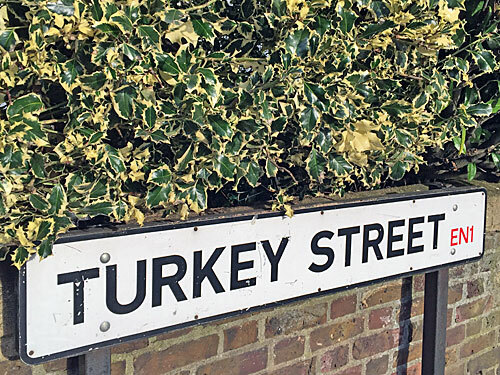 Turkey Street's seen many Christmases. 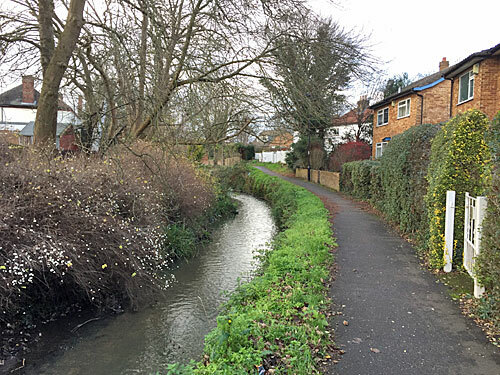 In medieval times the hamlet where the Hertford Road crossed a small stream was called Tokestreete, likely after a family called Toke. 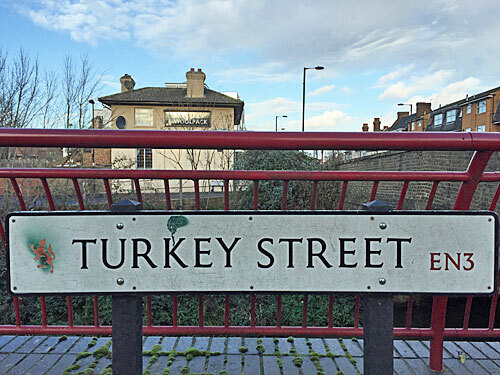 By the 19th century the hamlet's name had changed to Turkey Street, and its associated stream had become the Turkey Brook. 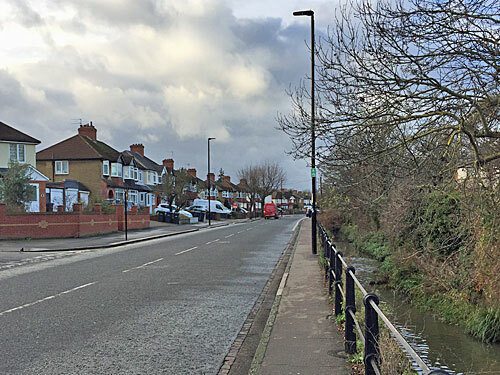 Today the local area is commonly known as Enfield Wash, and Turkey Street is the name given to the lane which runs west alongside the brook. 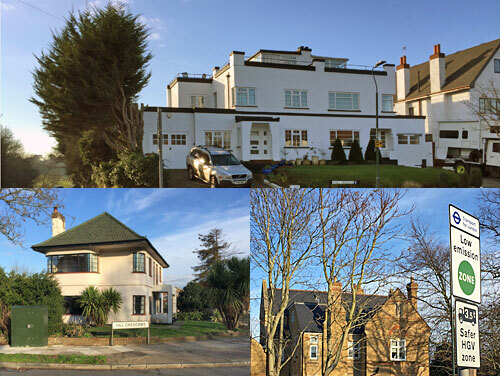 It's also an almost perfect microcosm of Outer London, with housing ranging from timbered cottages to Victorian terraces and from interwar semis to towering flats, plus shops, a school and a Zone 6 station. Stuffed with interest, you could say. 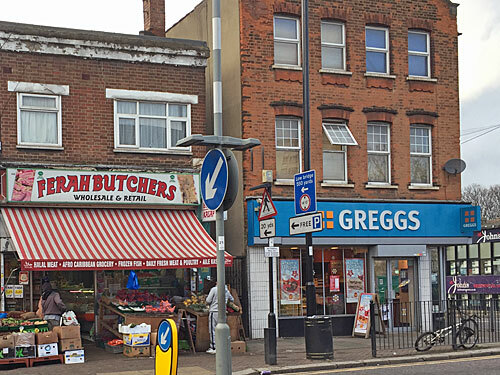 Turkey Street begins at the Greggs on the Hertford Road, where the windows are speckled with snowflakes and the meal deal features a Festive Bake. It doesn't get much Christmassier than that. The Turkish butchers nextdoor has XMAX TREES AVAILABLE, the S.O.Y. Pound Store offers household stocking fillers and Öz Royal Kebab wishes all its customers a very Prosperous New Year. My mum was born just round the corner, so these would have been the local shops during her very first Christmas. The retail offering has evolved far beyond anything that traded here back then. The first stretch of Turkey Street is unusual because houses run along only one side, with the river (now in deep channel) on the other. The first houses, beyond the shoppers' car park, are late Victorian. They've not gone overboard with the Christmas decorations this year, but I did spot one resident stepping out in a Santa hat, then driving off in her Volkswagen Golf Estate. 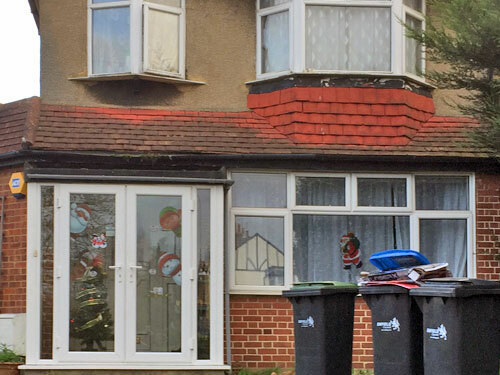 The first house to have made an actual effort is on the corner of Ascot Gardens, which has plastic snowmen stuck to the front door and a Christmas tree in the porch decorated with a strand of glittery tape. If someone here is getting a games system for Christmas, the box sticking out of the dustbin ensures it won't be a surprise. After a run of postwar semis, lightly decorated, the Turkey Brook swings away behind a row of old cottages and what used to be a pub. This was called The Turkey, perhaps too obviously, and has been converted recently into two decent sized homes. From the footbridge I spotted the almost carol-worthy complement of seven ducks-a-swimming, plus a fine crop of white berries overhanging the water, well out of any flower arranger's reach. The houses along this back path range from postwar infill to pristine detached bungalows, and the Parcel Force driver trying to deliver a festive parcel was having trouble finding one of them. Up next is a patch of park where winged fish/squirrel hybrid sculptures are the norm, and a band of wilted bouquets around a lone tree marks an unhappy anniversary. 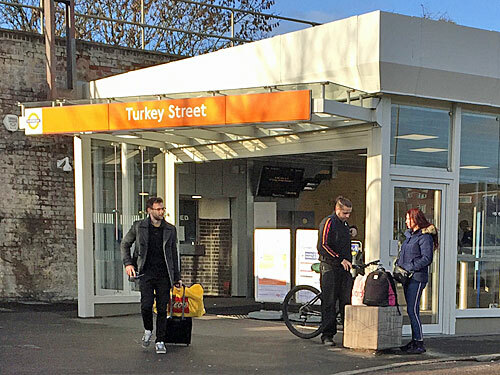 Here too is Turkey Street station, once a minor halt called Fortyhill, now an orange-branded portal which whisks local residents in and out. One emerging passenger tugged a wheelie suitcase behind him with a carrier bag from the LEGO Store perched on top. Another returning for the holidays struggled repeatedly to squash her suitcase into a car boot. The First Choice off licence, squeezed into a small hut just before the river disappears from view, is not overstocked with festive fare. Three ice cream vans parked outside a house on the corner of Brookside Gardens await the season when they can once again emerge from cold storage. The 327 bus slinks intermittently past, unmarked by any bus stop nor any hint that it goes by. The street's sheer residential variety is enhanced by a row of bungalows, a be-chimneyed Victorian lodge and a jarring nine-storey cuboid called Brookbank. I was expecting more wreaths on doors, or lights in windows, but was disappointed. Abruptly this ancient lane is severed by the Great Cambridge Road, a roaring dual carriageway built in the 1920s to relieve the Hertford Road, back where we started. Those on foot must take a multi-coloured subway, whose tiles spell out HAPPY, SMILE and other upbeat words so long as you squint carefully enough. Beyond this the residents are trying a little harder to be festive, with a string of illuminable icicles above one door and a Christmas tree decoration stuck to the glass at number 133 (affectionately known as Chateau Turkey). 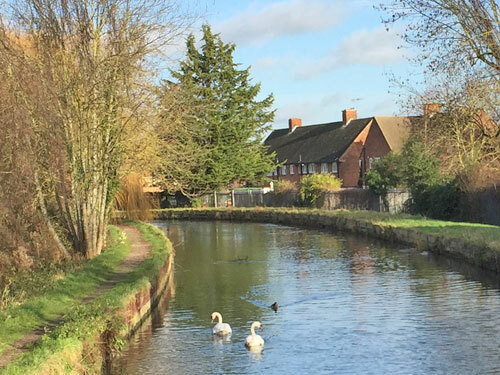 After crossing the New River, where two swans-a-swimming once again failed to hit the festive target, Turkey Street becomes inordinately rural. Across the sports fields I was suddenly surprised to hear the voice of Andy Williams pronouncing this The Most Wonderful Time Of The Year, followed by Dean Martin urging Let It Snow. The Christmas tunes continued for the rest of my journey, it turns out emanating from the local primary school whose teachers were using music as a form of end of term crowd control. And finally I reached the million pound houses at the end of the lane - smart, lilywhite and early 19th century - whose front door decorations brought Turkey Street's wreath count to a final tally of thirteen. I'd reached the hamlet of Bulls Cross, and the gates of Myddelton House, which has one of my favourite open-to-the-public gardens in the whole of London. I was the only visitor, late December not being peak-visiting season, and the ladies in the cafe were looking somewhat underutilised. 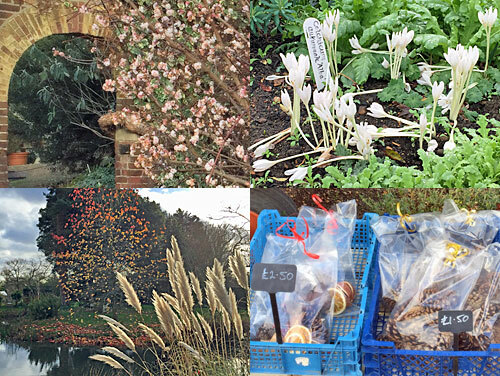 But the grounds still had a few treats to bestow, including a clump of pink blossom, a patch of snowdrops and an acer by the lake that'd not yet dropped its vibrant red leaves. A dozen pine cones in a gift bag were on offer for £1.50 by the honesty box, with a variant selection including crystallised orange for a pound more. A very ordinary yet extraordinary road in the outer suburbs, that's Turkey Street at Christmas. 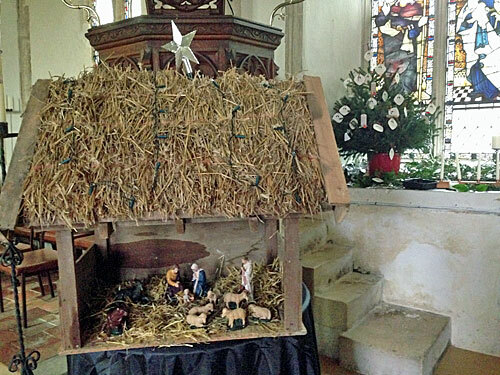 This year's Christmas Number 1 was announced yesterday. In good news, you probably know the song, even if you've never heard the sausage roll version. But when did the Christmas chart topper go off the rails? Let's take a look back over 50 years and see. Christmas Number 1s were pretty much off the rails five decades ago. With the exception of Dave Edmunds these are all novelty songs, of a sort, without referencing any particularly Christmassy. That was an unfortunate title from the now-disgraced Australian. There are your classics. Many of the UK's most-replayed festive tunes emerged during the mid-1970s, which might be because they were immensely catchy (or might be because we've refused to let them go). Paul McCartney wouldn't have got his bagpipes to Number 1 at any other time of year. This might be as far down the list as you can sing along. These songs had gone off-topic somewhat. Another Brick In The Wall is one of the unChristmassiest records ever to make Christmas Number 1, while Don't You Want Me confirmed that a brilliant song could cut through the glitter and hit the top regardless. 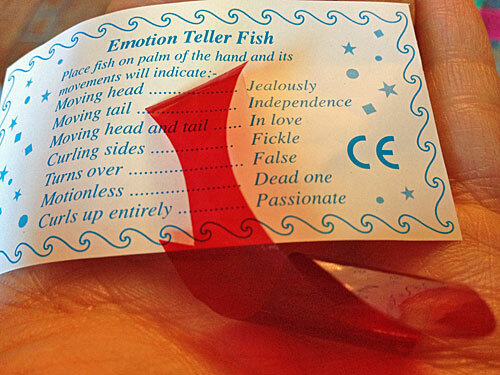 Elsewhere, novelty (and sickliness) abounded. 1984: Band Aid - Do They Know It's Christmas? In the mid-80s Christmas was back, if not initially for the happiest of reasons. Band Aid proved you can write a big hit to order... and appear on the list twice, as does Cliff, with Shakin' Stevens completing the festive contingent. Who'd have guessed the Pet Shop Boys would have intruded inbetween? And then, unless you count East 17's sleigh bells and furry parkas, specific Christmasness faded away again. Big name American singers were back in on the act, as were big pink novelty characters. And although you may not think of Bohemian Rhapsody as a Christmas Number 1, it's actually achieved the feat twice. This might be as far down the list as you can sing along. Ah, those three successive years when the Spice Girls were unstoppable. If you count Westlife as a brazen attempt to devise an insipid male version, four. Here's the last sequence of Christmas Number 1s that could perhaps be described as 'normal'. A novelty song, a celebrity duet, an all-female belter, a leftfield cover and a 20-year-old repeat. This might be as far down the list as you can sing along. But that appearance by Girls Aloud presaged what was about to happen next... total TV dominance. In the mid 2000s the X Factor destroyed the race for Christmas Number 1. Whatever record the winner released would instantly top the charts at Christmas, indeed was deliberately designed to, so how we cheered when Rage Against The Machine snuck in and stomped on Joe McElderry in the crucial week. Once the genie was out of the bottle, that an internet campaign could drive an unexpected song to Christmas Number 1, two followed on. As music headed increasingly online, the UK public preferred to give their money to a good cause rather than to Simon Cowell's bank balance. The X Factor hit back for a couple of years but it proved a last hurrah (and since 2017 the winner's single hasn't even been released in the right week to take the crown). In 2015 another charity campaign won out (if you can call the NHS a charity, which it isn't yet, but maybe that was the point). Then, unusually, the Christmas chart race returned to the realm of top pop acts. Proper chart heavyweights, not just warbling electronic voices bankrolled by formulaic producers. But this year the utter unexpectedness of the Christmas Number 1 is back again. The triumphant act is a YouTube vlogger from Hemel Hempstead with a novelty song based on the 1985 hit by Starship of almost the same name. It came from nowhere, propelled by the British public's love of an underdog and an excellent charitable cause (not to mention a love of meat-filled pastry tubes). It's endearing, it's rubbish, it's the sort of purchase you'll only play once, but it is inimitably the unpredictable spirit of the Christmas Number 1. Some things never change.